Digital Managers and Marketing Executives who need to produce tangible sales results from their digital marketing budgets. This programme will introduce you to the sales-centric processes involved in digital marketing. It is designed for future high performing digital marketers who know that connecting sales results to marketing activity in a crystal clear way is the path to digital success. 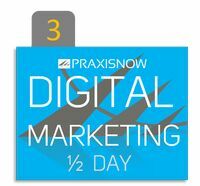 Unique among digital marketing courses, this single morning will focus exclusively on the digital activities that have greatest impact on sales results. These sales results can be defined as leads generated in a B2B environment or direct sales in an e-Commerce environment. More than ever before, digital marketers are expected to deliver more than beautiful digital media, well designed websites and brand-driven advertising. Yes, things such as website User Experience and high quality digital media are important, but digital marketing can have an even bigger impact on the sales performance of organisations. The idea of sales-driven digital marketing is often poorly understood or even avoided by marketing teams for fear of being measured! There is no better way to prove the value of digital marketing than by measuring it based on sales metrics such as leads generated, conversion rate improvement and cost per customer acquisition. This one morning will change the way you thing about digital! The Corporate Website – what does it do? What should it do? Why the concept of a brochure website doesn’t apply in best digital practice. Which channels to invest in. How should investment be focussed?